Learn to crochet with BurdaStyle. You'll get the premiere issue of CrochetScene magazine, featuring the beginner friendly Riff Cowl. Step-by-step video instructions are included. Even beginners can make this stylish accessory! Choose from three trendy colors: BurdaStyle's favorite Strawberry Smoothie pink, Spice, or Persian Peacock. Add to your DIY wardrobe with BurdaStyle + Crochet! This new kit features the premiere issue of CrochetScene the best resource for fashion forward and beginner crocheters. You'll find 35 projects, including the Riff Cowl. This kit gets you started with Brown Sheep Company Lamb's Pride Worsted yarn and video instructions to start the stylish Riff Cowl. 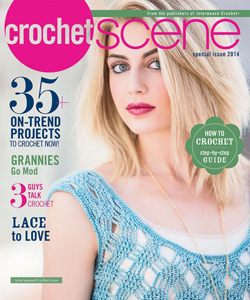 The special issue CrochetScene features 35+ on-trend crochet projects designed with the new crocheter in mind. Choose from Persian Peacock, Spice, or Burda pink Strawberry Smoothie. Learn how to crochet with this video, from your first slipknot to stitches you'll need for the Riff Cowl. A hook and yarn needles are included so you can get started right away.